“The Cookie” is Salt of the Earth Bakery’s original recipe—rich chocolate chips in buttery batter with flaky Maldon sea salt. Crunchy, briny sea salt from Bali boosts the flavor of plump raisins and oatmeal in The Wild Oat. In the Chocoholic, three kinds of chocolate converge with a dash of Maldon sea salt. 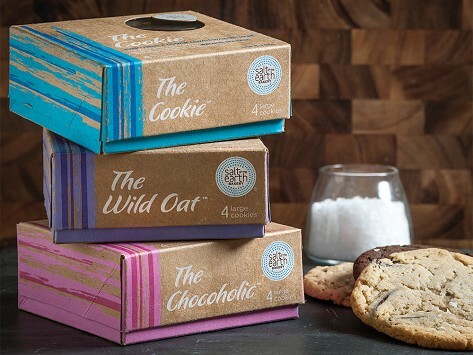 Pack of 3 boxes of Salt of the Earth Bakery Cookies. Box Dimensions: 4" x 4" x 6"
I love salty sweets, and these cookies and brownies definitely fill the bill! For all of you out there who thinks salt is the perfect accompaniment to sweet, this is your treat! An indulgent treat, a little pricey, but as a special treat very good. Yummy - Best Oatmeal Cookie Ever! Take tastebuds on a decadent adventure with killer cookies and brownies from Salt of the Earth Bakery. This Brooklyn-based bakery ups the ante with sea salts from around the world. The salts are specially chosen to intensify the flavors of each particular treat. These beautifully boxed sets are a triple threat. In the cookie collection, “The Cookie” is the centerpiece—rich chocolate chips in buttery batter with flaky Maldon sea salt. A three-chocolate cookie and an oatmeal with plump raisins round out the trio. The brownie set boasts triple chocolate, espresso-infused, and one with luscious ribbons of handcrafted caramel. Founders Alexandra and Haskel Rabbani are married with three kids (their “taste testing team”). Alexandra always liked to cook, but she found her stride when Haskel was preparing for the bar exam. She started concocting out-of-this-world goodies to fuel his 17-hour study sessions. “The Cookie” was a home run with Haskel and all their friends. They dared her to take it to the local market, and the buyer placed an order right away. The rest is Salt of the Earth Bakery history. With three kinds of treats in presentation-ready packaging, it’s an experience whether you give them away or keep them to yourself.